The most striking features of the political history of France during the tenth and eleventh centuries are the conflict of the feudal aristocracy on the one hand, with monarchical and democratical power on the other, and the influence exerted by the Crusades on both. The Crusades aided much in the accomplishment of the final result, the destruction of the power of the nobility. In the first place, they glorified the character of feudalism by enforcing the principles of chivalry. To be a "true knight," a man must be devout, just, merciful, and pure. Many Crusaders, indeed, fell far short of this high ideal; but there can be no doubt that, on the whole, it elevated the standard of morality, and checked the rampant tyranny which had previously prevailed. Founded on a principle of sincere though mistaken piety, the Crusaders recognized all who took the cross as brethren; hence the meanest serf became, in some measure, free; and the same benign sentiment extended its effect to all classes. The attraction of a common cause in foreign lands further contributed to wean the Crusaders from the class quarrels and domestic feuds which occupied them at home. During their absence the crown was enabled to acquire a strength which had previously been spent in the repression of constant rebellions. And the need of money for the expedition obliged many feudal lords to contract with the communes for the sale of lands or liberties. Such was the condition of France at the commencement of the thirteenth century. The balance of power, however, was only sustained by the activity of all the parties concerned. The slightest wavering on the part of the crown would be fatal, the least opportunity seized. A wise, sincere, and humane ruler was needed to confirm and enlarge the vantage ground which law and order had already obtained; and such a ruler rose in the person of Louis IX., who ascended the throne in 1226. His father, Louis VIII., was a man of weak character, whose reign was chiefly signalized by the horrible persecution of the Protestant Albigenses of Provence, which, under the sanction of Innocent III., and later Popes, had been carried on by Simon de Montfort and other fanatics, since 1209. Louis himself had died of fever when about to commence the siege of Toulouse. The Queen Dowager, Blanche, of Castile, was a woman of great energy, and during the minority of her son she bravely contested her claims to the regency of the kingdom against those of Philip, her husband's brother, whom Henry III., of England, supported. She appealed, not in vain, to the gratitude of the metropolis, which the Capetian kings had befriended; and at her call a large force of citizens joined her. With their aid she defeated Philip and other nobles, who opposed her son's coronation, and by two treaties, in 1229 and 1231, she both extended the limits of her kingdom and put an end to civil war. Over Louis, who was but eleven years old when his father died, she exercised a somewhat rigorous, but a holy and prudent discipline, to which he was much indebted for strengthening his moral and mental constitution. He was educated at the Abbey of Royaumont by Vincent de Beauvais, and though not remarkable for talents, possessed considerable decision of character, and a large share of personal courage. It is, however, by the piety, purity, and benevolence of his soul that he stands forth so prominently in the history of Europe. The year of his coronation all the jails of the kingdom were thrown open by the royal command. A nature more truly loving and lovable has rarely been bestowed on any member of the human family. Yet, with all these paramount excellences, his life presents a tragedy--the fatal consequences of unreasoning faith. All his errors--we cannot justly call them faults--proceeded from this prolific source. Before recording these, it will be gratifying to point out the happier results of those noble and wise qualities which have consecrated his name. The Education of Louis IX. After the treaty of 1231, France remained at peace for some years, during which time Louis married Margaret of Provence, a princess only inferior in worth to himself. Soon after attaining his majority he was called upon to contend with the Count of Brittany and other nobles who resisted his authority. At the head of his vassals Louis marched against the rebels, and was so prompt and energetic in his measures that the count was forced to yield and sue for pardon in the attitude of a criminal, with a rope round his neck. Henry III. crossed the channel with an army to support the rebellion, and recover, if possible, the possessions which King John had surrendered to King Philip. The armies met at Saintes, in 1242, where the French were victorious, the rebels subsequently submitting, and Henry returning home. 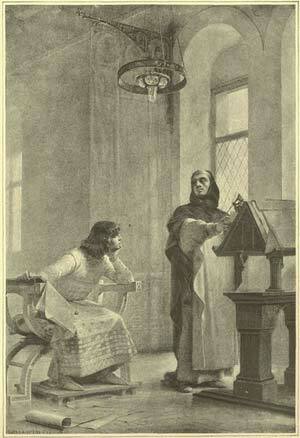 In 1244 Louis had a severe illness, which was attended with danger to his life. During the progress of it, he vowed to undertake a new crusade should he recover. The fulfilment of this vow was opposed by Blanche of Castile (who still had great influence over her son) and many of his best counsellors; but Louis was inflexible where religion and honor demanded a sacrifice. In 1248 he collected a large army, and prepared to start by way of Sicily, the nearest route to Palestine, when he remembered that the island belonged to Frederick II., of Germany, who was under excommunication by the Pope. All attempts to shake the decision of Innocent IV. failed; and yielding to the pious weakness of fearing to rest in an excommunicant's territory, Louis changed his plans, and determined to pass by way of Cyprus and Egypt--a route which proved the ruin of the expedition. He committed the regency of France to his mother, assumed the staff of pilgrimage, and accompanied by his wife and brothers, left Paris on June 12, 1248. He stayed for several months in Cyprus, until his armament amounted to 50,000 men, and then sailed for Egypt. Arrived at the port of Damietta, he caused the oriflamme (the national standard of France) to be waved above his head; and, arrayed in complete armor, he unsheathed his sword, and leaped into the sea, followed by the knights. The inhabitants fled, and the French took possession of the city. The inundation of the Nile prevented their further movements for several months. Licentiousness and disease were fostered by this delay, in spite of the king's remonstrances; and their unopposed success made the Crusaders careless as to the tactics of the enemy. On the subsidence of the Nile, Louis fortified Damietta, and left his queen and her ladies there, while he, with the main army, advanced on Cairo, the metropolis of Egypt, where the sultan resided. Near Mansourah, the Crusaders became perplexed by the intricacy of the canals, and a hasty dash across one of these, made by the king's brother, the Count of Artois, with 2,000 men, led to a calamitous result. Mansourah was apparently deserted, and the count's troops, who preceded their comrades at some distance, commenced pillaging the houses. The inhabitants, who were only concealed, showered down stones from the roofs; and at the same moment, a large body of the sultan's army made an attack in front. Louis reached Mansourah in time to save a few of his men, but found his brother and several others slain. The Moslem camp was captured, but proved a doubtful prize. The plains were barren and scorching, and the harassing assaults of the Egyptians, who poured "Greek fire" (missiles filled with combustible materials) on their foes, rendered the situation more intolerable still. Pestilence broke out, and the king himself fell dangerously ill. He then ordered a retreat to Damietta, whither the sick were to be conveyed in galleys. These were intercepted, and the sick murdered by the Egyptians; while, at the same time an attack was made on the Christian camp. Louis was so weak that he could scarcely ride, but nevertheless would not desert his post. He rode between the ranks, encouraging his men, till he fainted and was obliged to withdraw from the field. His quaint and affectionate biographer, the Lord of Joinville, who was with him in this expedition, thus describes the scenes which ensued: "Of all his men-at-arms there was only one with him, the good knight, Sir Geoffrey de Sargines; and who, I heard say, did defend him like as a faithful servant doth guard his master's cup from flies--for every time that the Saracens did approach the king he defended him with vigorous strokes of the blade and point of his sword, and his strength seemed doubled. At last he brought the king to a house where there was a woman from Paris; and laying him on the ground, placed his head on the woman's lap, expecting every moment that he would breathe his last." In this half-dying condition a body of Egyptians found him, and bore him to the tent of the sultan. The defeat of the Christians, who were weakened by the climate, disease, and want of food, was general; many fell by the sword, and the rest were taken prisoners with their king. In captivity Louis showed a noble resignation and courage amid the apostasy of many. He won the respect of the sultan, who treated him with generosity, and listened to the terms of ransom which he proposed. The queen remained at Damietta, which was strongly garrisoned. Fearful, nevertheless, of falling into the hands of the Moslems, who would have carried her into the sultan's harem, she prayed an old knight in her suite to slay her with his sword, should there be any danger of that event. "I had determined on so doing, madam," was the answer. Margaret's heroism was not put to this severe test, for the surrender of Damietta was one of the conditions of her husband's release; and after paying in addition a sum of 400,000 livres, Louis was on the point of being set free. An insurrection, however, suddenly arose among the Mamelukes, or Tartarian troops, in whose hands the real power of the state was placed, and the sultan was murdered. A party of the assassins, it is said, entered the chamber of Louis with their scimitars drawn, but his calm dignity saved him, and the treaty was carried out by the new sultan. Many of the French nobles returned home, but the king, faithful to his vow, proceeded to Syria, and spent four years in strengthening the fortresses of Tyre and other Christian towns, redeeming many Crusaders from slavery, and reducing to order the disturbed condition of the country. The death of the Queen Dowager Blanche, who had governed France wisely during her regency, recalled him in 1254, after an absence of six years. He still wore the cross upon his shoulder, as a token that his oath as a Crusader was not yet fulfilled; but he never once neglected the more pressing and necessary duties which devolved on him as a monarch. His immediate work was to supersede the arbitrary legislation which the nobles exercised in their manorial courts over their tenants. He accordingly introduced into general use the famous code of Roman laws known as the Pandects of Justinian, and constituted the chief civil lawyers, who had studied its contents and were best acquainted with its principles, into a Parliament, or Court of Justice. The nobles and the clergy were duly represented in this assembly; but its clerks, or lawyers, were especially favored by the king, who seconded their own efforts to absorb the business of the court as much as possible. Louis further mediated between the tyranny of the nobles and the weakness of their tenants, by encouraging the practice of appealing to the crown in case of injustice. This he even extended to ecclesiastical matters; a bold step for one so devoted to the Church. The prohibition of the barbarous custom of duelling to decide personal quarrels was another of his humane laws. These, and divers other ordinances, founded in a like spirit of equity, are known in a collected shape as the Institutes of St. Louis. His enactment touching appeals from the Church to the Crown, and the prohibition which he likewise issued against the levying of money in France for the use of the Pope without the king's license, are known as a Pragmatic Sanction--a term applied to any especially important national decree. Louis set the example of enforcing the laws personally, and none was fitter to administer them than he. Under an oak in the forest of Vincennes, near Paris, often sat the good king to hear appeals and petitions from his poor subjects. His social and foreign relations were as fully attended to as his political reforms. He first placed the French navy on a substantial footing. To him Paris owed a public library, a hospital for the blind, and the establishment of a body of police. Under his sanction, also, his confessor, Robert de Sorbon, founded the famous theological college called by his name. So scrupulously just and honorable was Louis, that he appointed a commission to ascertain what restitution of territory should be made to nations which had been mulcted by the conquests of his predecessors, and he thus more than once sacrificed extensive possessions for the sake of a principle. By a treaty in 1255, made with Henry III., Louis restored to the English crown the provinces of which Philip Augustus had deprived it, and obtained in return the surrender of Henry's rights in Normandy and other fiefs. 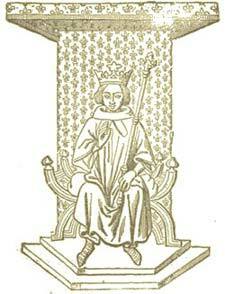 The reputation which Louis thus acquired among his fellow-monarchs led to his being asked to act as mediator in several quarrels, and gave him many opportunities of exhibiting his peaceful and loving policy. The mental blindness of which we have spoken led him to commit errors, which, if his misled conscience had not sanctioned them, would deserve the name of crimes. Toward Jews and heretics he showed no mercy, issuing severe and unjust laws against them "for the good of his soul." The duty of the historian is to record these failings of a noble nature as impartially as its beauties; but the evil must, in all fairness, be credited to the Church and system which taught, and not to the believer who practised. In 1270 the affairs of the East again attracted the attention of Europe, and recalled Louis to the fulfilment of his vow, which he had only postponed. The Greeks had retaken the city of Constantinople from the French and Venetian Crusaders some years previously, yet the reconstitution of the Christian Empire of the East had not availed to check the aggressions of the Moslem in Palestine. Benocdar, the Sultan of Egypt, had already taken Caesarea and Jaffa; and news now came that Antioch had fallen, 100,000 Christians having been massacred in the siege. The seventh and last Crusade was at once set on foot by outraged Europe, and Louis led the expedition, in which France was, as usual, foremost. He raised an army of 6,000 horse and 30,000 foot, and was accompanied by his three sons, the King of Navarre, and several nobles of high rank. His brother, Charles of Anjou (the new King of Naples), and Edward I., of England, (then prince), were to join the French in the course of the year. Some romantic intelligence that the Moslem King of Tunis was desirous of being baptized, induced the pious Louis again to try the African, instead of the Asiatic, route to Palestine. He narrowly escaped with his life, in a tempest which overtook the fleet in the Mediterranean, but landed in Sardinia, and after recruiting here again set sail, and anchored off Carthage. He met with opposition, instead of welcome, from the inhabitants of the coast, and was obliged to besiege Tunis. The excessive heat of the climate and the unhealthiness of the soil proved a second time fatal to the army. Plague at last broke out, and Louis was himself seized. Finding himself dying, he sent for Philip, his eldest son and successor. Placing in his hand a written paper, the good king prayed his son to follow the directions which it contained--directions for the conduct of his life, as king and individual; enforcing those principles of love to God and man which had guided his own career. Then, requesting to be lifted from his bed, Louis instructed his attendants to strew the floor of his tent with ashes and place him thereon, that he might die as he had lived, in an attitude of humiliation and penitence toward his creator. This was done, and shortly afterward, as though in vision fulfilling the vow which he was not permitted to realize, he uttered, "I will enter thy house--I will worship in thy sanctuary!" and expired. His age was but fifty-four. A few hours elapsed, and the sound of a trumpet echoed through the plague-stricken and half-deserted camp. It was the note of Charles of Naples, whose fleet had just arrived off the coast. Meeting with no response, he rode rapidly toward the tent of the king, and on entering saw his body lying still warm upon the ashes. The rites of burial were not performed with the usual formalities, his remains being distributed among his relatives. The flesh was kept by Charles, who buried it, on his return to Sicily, in the great Abbey of Monreale, at Palermo. The bones and other parts were conveyed back to France. Those who have visited Paris will not forget the exquisite Gothic structure known as the "Sainte Chapelle," which is attached to the Palais de Justice, containing the courts of law. It was erected by Louis as a receptacle for certain supposed relics of Christ. The windows of the chapel are entirely composed of stained glass, and as the sunbeams strike upon them, their tints of crimson, blue, and orange blend into a rainbow-like harmony of glowing and lustrous color, which recalls the heart of Louis IX., enshrined within those walls, as its fitting human antitype. He was canonized about thirty years afterward, under the title of St. Louis.